In America and England, quantitative easing has already been tried and failed miserably. High-rolling fraud-infected banks and their co-conspirators (investment banks) had their bad debts substantially written off on the premise that they would then be solvent enough to begin lending. Yet they still do not lend, preferring to go back to their old ways of juicing the markets and profiting off the rise. Meanwhile, in England and America the rich have become vastly richer as the middle class takes the strain against the harness and the jobless and under-employed become legion. Both nations are staggering at the low and middle income levels. Is this Mario Draghi’s prescription for a faltering Europe? Having watched the European cow nearly die out on the thin grass of austerity, does he now mean to sell off its remaining milk to the fraudsters and the rich? A touch of background may be helpful: In the heady, gambling days of deregulated banking, new investment vehicles were created. You know what a vehicle is. It’s what you use to drive away from a robbery. That getaway car has been polished-up, a larger engine installed and stands ready at the curb. No guns or masks required, as what was once cause for a prison term has now become an inside job. One of those vehicles (but far from the only one) was the sub-prime mortgage scam that gave crap mortgages to unworthy borrowers, then sold them as repackaged class triple-A investments, knowing they weren’t worth the paper they were written on. Within the banking industry, they were known as ‘liar loans.’ In fact, now that they are being foreclosed by the millions, the paper they were written on can’t even be found, having been sliced and diced and sold to tens of thousands of investors. Retired judges have been hired by the banks to stamp falsified phony documents as authentic, without ever reading them in a frantic effort to put some paper on the table. Another was AIG’s toxic Investment Default Swap scheme that insured against an investment going bad. An ordinary enough idea, it became a toxic scheme when the same policy on the same investment was sold to thousands of investors. Essentially, an estimated $50 to $70 trillion dollars of such policies were issued by AIG (and others) without a dime to back them. It was all gravy, vastly profitable and the insurers were convinced that markets only go up, so what was the risk? Risk finally visited the banks and insurers like Jacob Marley’s ghost in 2008. What goes up must come down is an axiom and it all came down around their ankles. Banks are deathly afraid of what still remains on their books from all this fraud and investment engineering, as well they should be. These trillions in liability are a stinking pile no sane man or institution would touch, except for one. The European Central Bank is the lone institution left standing that is insane enough for the challenge. Mario Draghi is now suggesting a failed strategy for Europe--quantitative easing—essentially inventing money to buy this toxic crap that no one else will touch. Meanwhile, Mario pays not the slightest attention to what happened when the Federal Reserve Bank in America and the Bank of England did the very same thing. Let the banks struggle with the fruits of their misdeeds. Take the invented money America and Britain wasted (as Draghi now intends to replicate) and invest it in schools, roads, bridges, sewer systems, green electric energy, manufacturing, research and development, housing and agriculture. These are tangible assets, something of value left at the end of the day, all of which will put people to work and leave a legacy of lasting value. 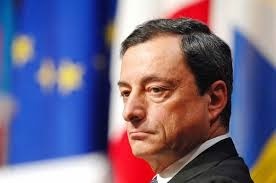 Europe cannot allow its Central Bank to burn the furniture to warm the house. There is no warmth in this scheme, only misery and another decade of austerity. There are no investment vehicles other than people who can feed, educate and house their families. Three are things necessary for human health, happiness and advancement—someone to love, something to do and something to hope for. All three are achievable and will build a strong, prosperous, contented and democratic Europe. Mario Draghi’s quantitative easing answers none of the three. If you fancy videos and want another slant on money thrown away in Britain, check out How to Waste £375 Billion.